Tonight’s Game: The Utica Comets face off against the Rochester Americans for the first time this season. 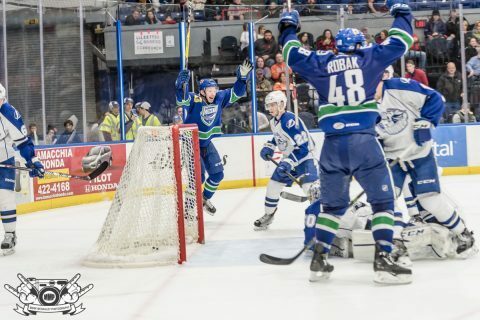 Puck drop at the Adirondack Bank Center is at 7 p.m.
Last Game: Reid Boucher and the Comets offense stayed hot for the second night against the Toronto Marlies as five players scored en route to a 5-3 win Sunday evening at the Coca-Cola Coliseum. Boucher has now scored in each of the Comets five games this season and leads the league with eight goals. Ivan Kulbakov stopped 38 shots to earn his second straight win. Head-to-Head: This is the first meeting between the Comets and Americans this year. Utica dominated last year’s season series, going 7-1-1-1 against Rochester. The Comets are 24-9-2-1 all-time against the Americans. Scouting the Americans: Rochester comes in with a 3-2-0-0 record and is in a three-way tie for second place in the North Division. Victor Olofsson leads the offense with eight points, followed by Zach Redmond with seven points. Adam Wilcox is the top goaltender with a 2-0-0 record, a 2.48 goals-against average, and a .900 save percentage. Chasing History: If tonight’s game sells out, the Comets will have sold out for the 120th consecutive regular season game, tying the AHL record. The record is currently held by the St. John’s IceCaps. If Friday’s game sells out, the Comets will break the record. White Hot: Reid Boucher continues his incredible start to the 2018-19 season. Boucher is the first AHL player with 8 goals in his team’s first 5 games since T.J. Brennan did it with Toronto in 2013-14. The forward is tied for the league lead with nine points this year. Taking Advantage: Tanner MacMaster is certainly taking full advantage of his opportunity. MacMaster is third on the team with five points (1-4-5) in five games this year. The forward earned an AHL contract this summer after posting seven points in 13 games while on an ATO with the Comets last season. Spreading the Wealth: The Comets have gotten offense from all over the lineup this season. Four players have at least five points or more and 11 skaters have scored at least one goal this season. Additionally, 20 players have recorded at least a point through the first five games. Next Game: The Comets are back in action Friday night when the Cleveland Monsters come to town for the first time since the 2014-15 season. Puck drop at the Adirondack Bank Center is at 7 p.m. Fans are encouraged to utilize the ticket exchange website, StubHub!. The game can be heard on 94.9 KROCK and viewed on AHLTV. What did we Learn Tonight as Bolts Dominate Hurricanes? Will Lightning Strike in the Burgh Tonight?